More engineering hours are needed to allow for ageing rail assets to be upgraded quickly, said Transport Minister Khaw Boon Wan. This means that train operating hours will likely be reduced. So far, upgrading work has been done on sleepers and the third rail, said Mr Khaw. Sleepers are used to hold rail tracks in place, while the third rail supplies power to trains. Work still needs to be done on the signalling system, the power supply, trains and track circuits, he added. "That is why we need more engineering hours. This can only come if we reduce train operating hours. It is a zero-sum game," Mr Khaw said at the Future Railway Technology for Depot and Trains event, held at SMRT's Tuas West Depot yesterday. He did not say when the shorter operating hours are likely to be introduced, or how long they are likely to be reduced by. Mr Khaw was reiterating the call he made in Parliament on Nov 7, when he described the limited engineering hours as a "significant obstacle" to the renewal of ageing rail assets. He said then that "many more" engineering hours are needed, and this may result in shortened operating hours, even on weekdays. Engineering hours are limited to about three hours a night - when trains are not in service - though these have been extended on occasion to facilitate upgrading works. When sleepers on the East-West Line were being upgraded, certain stretches of the line were closed earlier to give rail workers more time on the tracks. Some stations on the line were also opened later on Sundays. The Bukit Panjang LRT line is also currently starting service at 7am instead of 5.30am on Sundays for an eight-week period which began on Nov 12, to facilitate the replacement of ageing rail mounting frames and rail expansion joints. Singapore University of Social Sciences transport researcher Park Byung Joon said closing lines half an hour earlier would increase engineering hours significantly. "The way the MRT system is built, there is no duplication of lines that would allow for rail engineering vehicles to work during service hours," he said. Mr Khaw also noted that while the Tuas depot, which opened in June, comes with a power substation that has increased the power capacity for the rail network by 50 per cent, existing equipment in the older substations has "aged significantly and is due for renewal". The North-South and East-West lines were previously drawing power from four substations - Buona Vista, Bishan, Stamford and Yasin - with the peak-hour power load at about 80 per cent of the network capacity. This was anticipated to increase by an additional 25 per cent, with the opening of the Tuas West Extension and completion of resignalling works, said Mr Khaw. This would force SMRT to tap backup reserves, he added. "We were cutting it real close. And the need to reduce overcrowdedness in trains forced us to add new trains, further pushing the limits on our power capacity." Mr Khaw added that a "qualitative upgrade" to train depots is needed, to build Singapore's capabilities in predictive maintenance for its rail network. These include the adoption of automatic vehicle inspection systems, which use cameras and sensors installed on rail tracks to monitor and detect trains. 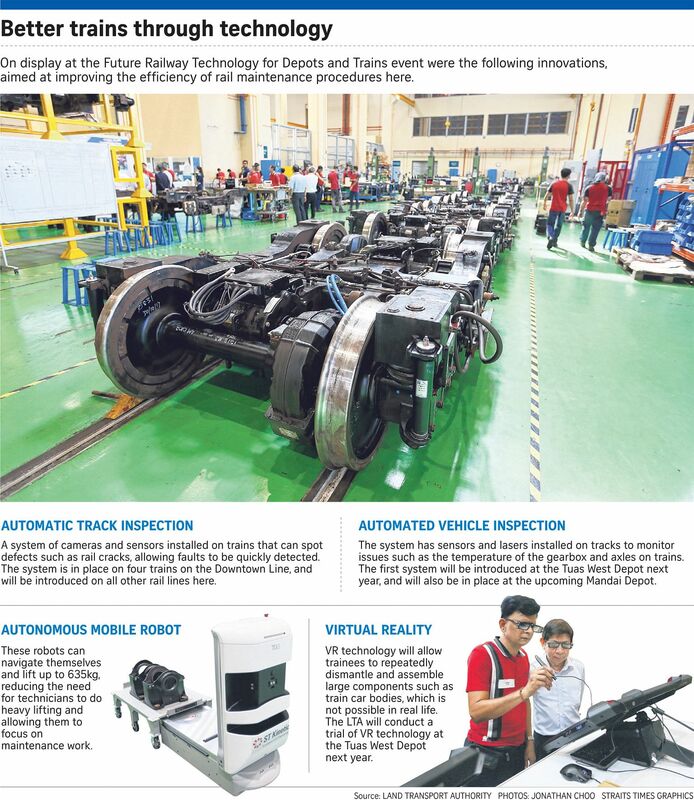 Technology can "improve quality and ensure accuracy in the maintenance process", said Mr Ravinder Singh, president of ST Electronics, which is working on technology such as robots for use in depots here.